Marie Kafka. Prag XIII-833. On a brown, tattered leather suitcase the name written slantingly in white has not paled. Under the M there’s a little squiggle, and a tad hurried dot… At corners, the seams are ripped, the iron latch in the centre is rusty. Marie must have painted her name. Perhaps Marie did not have a paint brush. Maybe she used a twig quickly snipped off from the tree or the back of her pencil that she must have packed in that brown suitcase before leaving Prague . Marie could have been 16. Probably 40. The calligraphed M and K do not reveal much. From the squiggle I imagine Marie, perhaps 16, in pigtails and a pinafore, her porcelain cheek blemished with the anguish of a long train journey “to a new life” in Auschwitz. The moment she hopped off the train, the German Nazi soldiers must have impounded all her belongings. Her dolls. Her diary. Her chemise. Her beads. Everything that she brought from Prague . At the ramp, with the flick of his gloved hand the brusque, uniformed army commander must have picked her for slave labour. Her long blonde hair must have been sheared for sale at half Mark per kilogram. Every morning Marie must have woken up to watery coffee for breakfast and insipid rutabaga, potato and groats soup for lunch. She must have worked gruelling 12-14 hours in the synthetic rubber factory. Marie must have slept hungry every night, for the food was never enough. And then must have dawned that fateful morning when Marie would have been compelled to strip and get ready for the “shower”. Marie must have gingerly walked the dirt track into the innocuous looking building and peered at the fake shower heads. She must have been naked when the Nazi soldier dropped the powder blue Zylon B pellets through the chimney chute. Marie must have coughed, gasped, wheezed, puffed… In 20 minutes, Marie must have died. And then her body would have been laid on an iron gurney and shoved into the fire oven. In a blink, the porcelain-skinned Marie must have turned to ash. Just a handful of burning ash. The SS guards (Schutzstaffel [SS] was Hitler’s paramilitary unit that grew into Fuhrer’s Praetorian Guard and was responsible for the most heinous Nazi crimes) must have callously dumped that handful of ash into the river. Not a drop of tear. Not a murmur of a prayer. No epitaphs. Nothing for Marie Kafka. Not even dignity in death. More than 60 years later all that remains of Marie is that brown suitcase. Her name painted in white. Standing behind the glass pane in Building No. 5, I spot Marie’s suitcase, piled grimly amidst thousands of other suitcases. There’s Klement Hedwig’s natty portmanteau, on it just the name and a date: 8.10.1898. There’s L. Grootkerk of Holland with a date: 11.10.05. Zdenka Fant – a mere number: S716. Hundreds of them. Perhaps thousands. So many names. Each a poignant story. So much brown behind that glass pane. Not one swatch of red. Or yellow. The suitcases are empty. There is nothing inside. Except death. And humanity that was brutally killed in the red brick buildings of Auschwitz , the largest Nazi concentration/extermination camp where more than 1.3 million people, mainly Jews, were killed. I head back to 1939, to history, to Hitler and his fanatic zeal of annexing more land into German tutelage. Even before World War II began, Hitler had tasted blood, Austria and Czechoslovakia fell into his kitty without a skirmish. His next stop: Poland. Much before the sun woke up on September 1, 1939, the marauding German army had bombed Poland into a rubble. Two days later, England and France declared war on Germany. The Second World War had begun. “This is Auschwitz…” I heard the guide. Faces have clamoured my imagination, they are getting blurred - faces of happy, smiling peasants in Oswiecim before 1939 overlapping the skeletal, bony, hungry, sleepless deportees at Auschwitz. I cannot fathom Hitler’s hatred for the Jews; I cannot reconcile one’s man evil against the death of millions. I walk towards the first gate. There’s a skull painted on a wooden post. There are barbed wires everywhere, held taut at corners on cement posts. I touch the wire, it is sharp and prickly. I think of the prisoners, desperate to die to put an end to the Nazi cruelty, flinging themselves on these wires, electrocuted in a second. I shudder. The red brick buildings, 28 of them, are neatly arranged in rows, each with a number painted in black, each seemingly cookie-cut in design. There are dandelions fluttering in the morning breeze. I look at the green large trees, the grim guard towers from where the SS guards hollered for inmates to fall in line for the roll call that often took hours. I think of little children standing barefoot on snow waiting for their numbers to be called. Hungry children with barely anything to cover their bones. Waiting endlessly in -10 degree temperature. There’s silence within Auschwitz . Thousands crowd to the camp everyday. There’s deafening silence. No one is talking. Suddenly a bird’s twitter shatters the quiet monotony. 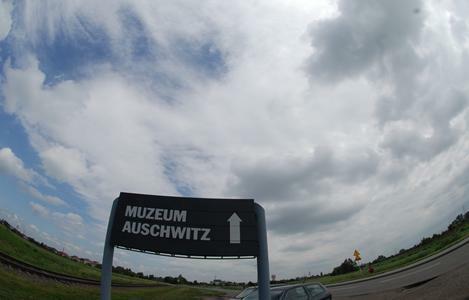 “ Auschwitz did not begin as a concentration camp, in the beginning it was a penal colony…Only when the Nazi policy towards the Jews changed did Auschwitz become an extermination camp…” I could hear the guide’s sing-song narrative. On June 14, 1940 , the first set of 728 Polish prisoners arrived from Tarnow . That was the beginning. Soon that trickle would include thousands who came from all over Europe in the dingy cattle carts (train bogeys) which had no toilet, a tiny hole for ventilation and only three days of food supply. Not that all journeys lasted three days – those who came from Greece chugged on the train for 17 days. With only three days supply of food and clutching to hope that they would start anew a life amidst the chaos and turmoil of World War II. But hunger was the least of their woes. As soon as they disembarked, the SS guards robbed them of all their belongings. They were left with nothing. Not even dignity. Not even a name. For at the ramp began the “selection”. With a ruler in a gloved hand a SS commander would signal left or right – right meant assignment to work, left death in the gas chambers. Death was a certainty for infants, elderly, infirm, pregnant woman, they were not deemed fit enough to work in the neighbouring factories where the SS men lent these deportees for three marks per person per day. Those who looked healthy, survived, but became numbers. Or winkles (triangles): red for political prisoners, green for criminals, black for prostitutes, pink for homosexuals. Everyone was tattooed a number, older children on their forearms, little children on their legs. In Auschwitz names became redundant, obsolete; all that mattered was numbers: 18564, 29871, 45618, 32091…Random numbers that became destiny. In Building No. 11, the names have returned on large laminated black and white pictures. I could read some. Michalana Petrenko, Pole, 13; Kopel Polter, Jew, 13; Anica Gruden Urisek, 14, fate unknown. From the stark walls emaciated children stare from the frames – rickety gypsy children victims of the medical experiments of Dr Josef Mengele, MD, Ph.D, who was researching the issues of twins and dwarfism in cooperation with the Kaiser Wilhelm Institute of Anthropology, Genetics, and Eugenics in Berlin-Dahlem; herds of naked women heading for the fateful “shower”; Franciscan monks from Niepokolanow being arrested; men cowering with fright in the transit camp in Pathviers, Drancy… Below the photographs is a chintz frock with striped patches, a pinafore with white buttons, a moth-eaten powder blue infant dress, a pink cardigan…They look sullied with time, their owners dead. And forgotten. I run my hand on the glass on the pink cardigan. A little baby’s cardigan. Must have been six months old. Must have felt warm in the freezing cold… On a large laminated poster statistics speak for themselves: 1.3 million killed. In bullets is the break-up: 1.1 million Jews. 150,000 Poles. 23,000 Gypsies. 15,000: Soviet Prisoners of War. 25,000: Others. I did not know where to count the baby in pink. I ran my hand on the glass pane again. Had she lived, that baby in pink would have been almost 70 now, a woman with cragged skin and gleaming eyes. But Auschwitz killed her. She must have been thrown in a burning pit or died of starvation. Or succumbed to diarrohea. Or died in her own filth or faeces. For no one could use the toilet more than twice a day; there was never enough water to clean up. Who knows what happened to that baby in pink. I step out of Building No. 11 where candles flickered in the starvation, suffocation and standing cells. In a cell, soiled clothes are hung on the wash basins. When the guards were too lazy to step out, they killed men inside these rooms; their blood flowing down the narrow drain.The walls of the standing cell have fallen off but I peer at the tiny 4 x 4 ft. space where four men were made to stand for hours as punishment. I stand by the wooden posts with iron hooks on which prisoners were hung with their hands tied at the back. I walk by the grey concrete Wall of Death where guards shot dead victims. There is not a drop of blood. It is impeccably clean. I touch the Wall, I almost hear a ricocheting bullet and the glee of the SS guards as a man slumped to death in his own pool of blood. I had walked back in time; I want to run away from Auschwitz, the barbarity is gnawing at my soul. Others from my group are heading to another building, I return to Building No. 5. In Building No. 5 I am still thinking of Marie Kafka. In a pile of 80,000 shoes I wonder which one is hers. I find a pair of white and maroon dainty stilettos, could be Marie’s. There’s a wooden clog. A black school shoe with missing laces. A strapped sandal. A pair of cowboy boots. 80,000 shoes. In another corner spread evenly on concrete is two tonnes of hair (during the 1945 camp liberation, 7 tonnes of hair was seized at the Birkenau camp), a tight plait held tidily with a rubber band, a mop of sinuous curls by a bale of fabric woven out of human hair. If you look carefully, in the fabric you can still real hair sticking out of the weft. Thousands of pots and pans dumped in a pit, mangled mass of hundreds of spectacles, countless tooth, shaving and shoe brushes. No names. Just personal belongings that the SS guards looted at the unloading ramp and stored them in Canada (warehouses were known as Canada; in Poland the term was used for the act of viewing fine gifts, a term stemming from the gifts that the Polish emigrants sent home from Canada). On a table I find punched tin lids, big and small – Derby Europe Cream, Kili Cream, Lola with a yellow lid, Schnoll pasta… Did the blue ornate Kili Cream belong to Marie? I wondered. “To the gas chamber,” the pretty guide in blue chandelier earrings instructed. Between 1941-1942, Auschwitz must have echoed these words a million times. During the two years that the gas chamber was used as a killing room, SS guards must have huddled the elderly, sick, infirm, children, pregnant women into the gas chamber which was originally a bunker. They knew not they were walking towards death; it was a “shower” that they had to undress for. Instead of a hot shower, it was Zyklon B that snuffed life out of hundreds in a few minutes. Zyklon B was not a new miracle cyanide for the Nazis, the blue pellets were meant to delouse the camp inmates, until they became death’s best alibi. The patent of Zyklon B was held by IG Farben company, but it was Tesch and Stabenow of Hamburg and Degesch of Dessau that supplied nearly three tonnes each month to Auschwitz, the bills of ladling for which were produced in Nuremberg. The Nazis knew that it would take 7 kilos of Zyklon B to kill 2000 people in 20 minutes – tiny blue pellets that could pass off as prescription pills packed in green tin boxes and labelled – ironically – Gift Gas. The drill remained the same. The pellets were dumped through the chimney and the doors opened after 20 minutes; no, not to bury the dead but to yank their gold teeth off and then the bodies shoved hurriedly into the crematoriums that bore the imprimatur Topf, the ashes later dumped in the river. Then another wait…Another 2000 hollered towards death in the gas chamber. My thoughts are interrupted. “This is the end of the tour.” From the black recorder I hear the scratchy voice of the pretty guide in blue chandelier earrings. I could hear the shuffle of shoes as others from my group hurried out. I did not. I had to finish my prayer. I closed my eyes and thought of Marie. And the million others at Auschwitz. Then a thought gnawed at my heart. What if Fate had played dirty with me? What if I were in Auschwitz? What if it were not Marie Kafka but I who took that train from Prague? What if? I walk back towards the main entrance. I see the barbed wires. The skull painted on a wooden post. I deposit the headphone and walk out. The clouds had vanished with the wind, the sun was sweltering, my throat was parched. I see an ice-cream kiosk. I pull out coins from my wallet to buy an ice-cream. I hear footsteps behind me. And a loud cry. Is that Marie? I think of an emaciated Marie, curled up in the bunk. Cold and hungry. Bruised and teary. Separated from the family. Alone in her despair. I walk away from the kiosk. I forget about my parched throat. The ice-cream. I buy a white rose. I do not know where Marie lay. For her, I place the rose under a tree. Marie must have walked that path once. I think of Marie and head towards the bus. I look back. A little girl in pigtails and pinafore had picked that rose…Marie must have looked like her before she packed that brown suitcase, painted her name, added the squiggle and took that train from Prague. If only there was no Auschwitz, Marie would have been nearly 70 today. Someone once said, “Ever since I have come back from Auschwitz, I have cried every night.” Ever since I have come back from Auschwitz, I have prayed for Marie every night. A question has been gnawing at my soul: What if Fate had played dirty with me? What if I were Marie Kafka who died in Auschwitz? What if….? I have returned from Auschwitz but that thought has left me sleepless. I can sleep no more, Marie.